On top of designing your booth, creating marketing collateral, and booking travel arrangements, handling the transportation and delivery of trade show equipment can feel overwhelming. Getting your booth materials to your show safely, on time, and for a good price requires some legwork and diligent planning. Staying organized and being aware of trade show intricacies can help. Proper labeling and paperwork are essential for all trade show freight. Without proper paperwork, you run the risk of misplaced materials. Be sure to include the following on all paperwork. Place this information on all sides of your pallet or crate/case. Since freight will be stored with numerous other trade show shipments, clarification matters. Some shows provide color-coded labels, which are used to help event staff decipher which rooms or areas the freight needs to go – use these if they are available. Trade show shipments have longer timelines than traditional freight. You may be required to ship product weeks in advance. Once the decision has been made to attend a trade show, develop a detailed timeline. It’s essential that you prioritize shipping because working ahead can open the door to more transportation options and lower pricing. Shows often have a preferred carrier, but you are not required to use them. You can ask multiple providers for quotes. We recommend quoting services at least two weeks to one month prior to your preferred shipment date. Carriers that specialize in trade shows could book up their capacity if you don’t schedule your orders in time. Additionally, with notice, carriers can optimize the movement of your freight. This means cheaper pricing. Trade show freight usually doesn’t get delivered to the event venue. Instead, freight is collected at an advance warehouse nearby then delivered right before the event. When your freight arrives at the warehouse, they charge a small holding fee and an added drayage charge for delivery to your booth. Depending on the volume of your materials, this usually costs a few hundred dollars. Even though there is an added cost, delivering to the advance warehouse is the most preferred and full-proof way to handle trade show freight. Working with the advance warehouse means you can track your order and that your materials will be waiting at your booth when you arrive. Drayage fees are charged for the storage, transfer, and delivery of material to/from the advance warehouse or venue to/from your booth. These are an unavoidable expense with trade show freight, but worth the cost. Fees can vary but trade shows typically have a 100 lb. minimum handling charge. So, rather than sending multiple small shipments, it’s best to consolidate your materials. Palletizing product or using a crate/case can help keep drayage costs down. If you are unable to deliver your freight to the advance warehouse within the timeline outlined, you do have another option. You can deliver directly to the venue, within a specific time window leading up to the event. Drivers must go to an offsite “marshaling yard” and wait their turn to be unloaded. Marshaling yards exist to keep the congestion away from the loading dock doors at the event facility and keep the movement of trucks and freight going forward. Incoming trucks are lined up by arrival time and delivery location. Yet, with no set appointment times, drivers can wait for hours. Not only is this frustrating for the driver, but it’s also costly for the shipper. Drivers often charge fees to make up for their lost productivity. If you must deliver to a marshaling yard, be sure to set expectations upfront and to arrive early. The only thing worse than waiting is not being prepared to do so. If you happen to forget something – such as a fresh print of marketing brochures or an extra case of product – you can usually deliver these items directly to your hotel. Call ahead to verify your hotel can accept the shipment on your behalf and can keep safe until your arrival. Know your plans for handling return shipments before you get to the show. Every show is different. Some have staff on site that can provide return shipping services and information, but the majority will require you to establish return shipping ahead of time. Ask for clarification in advance. Like quoting delivery, you can seek multiple quotes for return shipments. 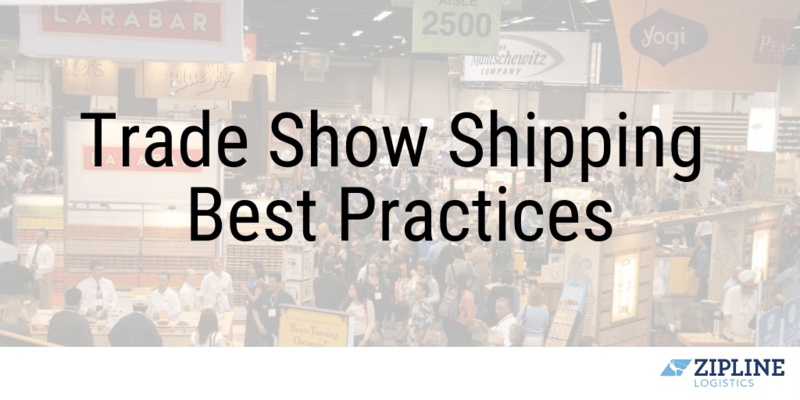 Best practice would be to let the carrier hired by the trade show itself to help with initial movement of goods from the show back to the advance warehouse. That carrier can also handle return shipment if you are pleased with their quoted price. If you do not want to use the suggested provider for return shipment, then you can use a different service provider to pick up from the advance warehouse and bring your goods back home. This choice can often help you save on transportation costs. You can also choose to bypass the suggested provider altogether and have your chosen carrier pickup freight directly from the show venue. If you choose this route, you will need to relay detailed information to the carrier about where to find your shipment and what time window they can pick up your order. Common reasons for forced freight are when a carrier doesn’t arrive on time or doesn’t have the right paperwork. Other reasons are more difficult to control, such as show staffers removing booth numbers or floorplan markers before all freight is picked up. 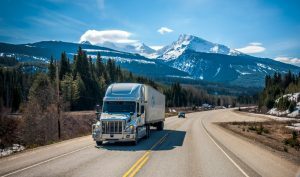 These missing details make it difficult for carriers to find the freight they are assigned to move. If your designated carrier doesn’t show up, you can either have your freight moved to the show’s advance warehouse for holding or use the show’s preferred carrier. The costs associated with forced freight will be higher than the original shipping rates you quoted. There will be added drayage and detention fees, plus inflated rates from the show carrier. If you are delivering temperature-sensitive food or beverage samples to an event, the logistics of delivery is slightly different. Temperature-sensitive deliveries can usually bypass the advance warehouse and marshaling yard but must deliver against an appointment and to a specific location. Be sure to ask your show contact for clarification. Freight is then kept in large coolers at the show venue for safe keeping. If handling your trade show freight still sounds overwhelming, know that a 3PL partner can help remove the stress. A 3PL partner can research the best available carriers and pricing, coordinate delivery, assist with paperwork, and keep track of your shipment, confirming its final delivery and pickup. 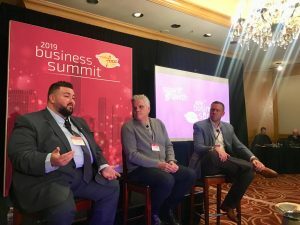 Do you need help with trade show shipping?